Home Page › Archive by category "Blogs"
The artist’s book has faced many evolving definitions over time, but at its core is the question What is a book? 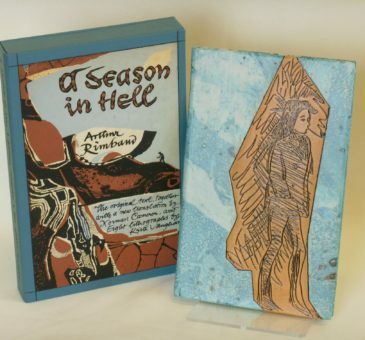 Often sculptural, the artist’s book is a unique way of presenting information, and can take the form of a traditional case-bound (‘hardback’) book, an accordion book, a stab-bound book, or other non-traditional structures. Its history runs the gambit of self-publishing and artmaking, from the gorgeously illustrated books of William Blake, through the Dada and Surrealist art movements, to Ed Ruscha and his Twentysix Gasoline Stations, one of the first modern manifestations of the artist’s book. What attracted me to the world of book arts was the fusion of printmaking and bookmaking; I was already drawn to the physical, textural aspect of mark making found in the print, as well as the inclusion of text that processes like screen printing and letterpress allowed. In my own work and in the work of Barry Ebner, a Berkeley-based artist whom I assist at The Studio of Nothing Else, creating art by hand is vital, as a way to directly interact with the work, to bring a sensuous tactility to the finished piece. With Fog Frac/Tured Pangea, the latest book printed at the studio, we have striven to create a book with an emphasis on the artist; the book is printed in a variable edition of twenty and features Barry’s monotypes, a collision of chaotic marks on a delicate paper surface. To create the plates for printing, Barry uses tools such as a Dremel to gouge lines into the plastic; these lines are then inked with one colour, and the entire plate is rolled up with black ink. Barry works reductively through the image, incorporating numerous textures; the work begs to be touched. We printed one poem throughout each book, working with two local poets, Sharon Coleman, a Berkeley-based poet and teacher, and Indigo Moor, Poet Laureate of Sacramento, and I contributed a poem as well. The text interacts with the images, swirling in the same space, forming a different reading of the poetry. There is a tension between abstract image and cleanly printed type. Barry works with traditional forms of book arts as a way to challenge viewers’ expectations upon the opening of a book, always asking What is a book? and What can be a book? In artist’s books, I look for these questions in their myriad configurations, in three-dimensional presentations of art, in the forms of the familiar and, just as often, the never-before-seen. As well as being an artist and author in her own right, Liz works with Barry at The Studio of Nothing Else, the talented printers at the Painted Tongue Press, and with us here at Swan’s Fine Books. Swan’s Fine Books has been fortunate to acquire recently a small collection of books published by the inimitable Allen Press. Herewith a few thoughts on the Press by our redoubtable cataloguer, Cassie Dowd. A fine press book should be simple. Its overall composition building heartily on the history of the text through hand-craftsmanship and artistic collaboration. The pages should turn with a crisp whisper, a soft instrument in the hand of the reader. If illustrations not original to the text are present, they should build on it seamlessly, abiding it in time. When done expertly the printer remains undetectable, an invisible hand offering up a slice of his or her own heart, though that concealed craftsman may also have a tale to tell. One such tale is the story of The Allen Press, spanning fifty years, which began, like many great stories in history, with a fourteen-year- old boy enchanted by a marvelous machine. Lewis Allen (1908-1998) was perhaps fated for the publishing business. His father worked in the newspaper business in San Francisco, and donated a Gordon-jobber to young Allen after it became obsolete in the rapidly changing business of commercial printing. Those early years were spent pursuing an income printing invoices, sale-slips and stationary for local merchants. He also hand-set, printed and distributed a neighborhood newspaper. After jamming his fingers in the press, Allen was slightly put-off from motor-driven presses, and when eventually college beckoned, the smell of printing ink would prove to be no less alluring. While studying at the University of California, Berkeley, Allen oversaw the publishing and printing of the University daily and monthly literary magazine; later he would publish the San Francisco Junior Chamber of Commerce monthly and The Book Club of California’s News-Letter. Most important in the story of a life dedicated to hand-press printing was Allen’s marriage to Dorothy Caswell (1908-2006), whom he met during his junior year at Berkeley. Their romance breathed another layer of passion and creative inspiration to the work of the press to which they would eventually dedicate their lives. Like many successful printers before them, the Allens were inspired by looking at books, originally those kept in Lewis’s father’s library of around 4000 titles. They were especially drawn to well printed works like those from Aldus to William Morris, Nash, Rogers and the Grabhorns. In 1939 they had a son and moved to a larger home; here they could take advantage of the bench model Pilot press offered to them by Harris Stearns Allen (Lewis’s father), who also wrote their first limited edition, The Trail of Beauty. It was about this time they set out to establish a standard for both “the ideal press book” and the selection of texts. The Allens agreed upon virtues for their publications gradually coalesced throughout their career. They built on a harmonious ideal composed of eight parts: a significant text, collaboration with an artist that will interpret but never dominate the text, balanced typography, exemplary hand-craftsmanship, high quality materials, pertinent use of color, durable binding, and the last being the combination of all the former to produce a fine, subtle, restrained but visibly robust bridge between author and reader. 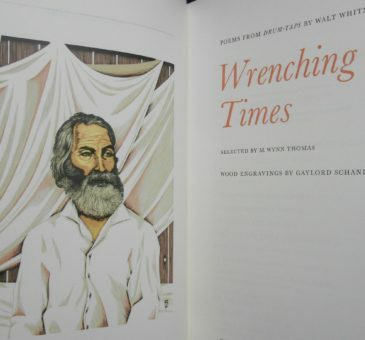 The text itself was chosen for several specific qualities: shorter lengths, limited publication history, notoriety of the author, and the work being prose over verse. Artists were another obstacle, and during the fifty years the press was in business, only nineteen editions were illustrated by “artists of stature”. Among those names were Durer, Picasso, Arp, Tanguy, Leger, Hughes-Stanton, Mallete Dean, Michele Forgeois, Joseph Low, Paolo Carosone, and Canaletto. Lewis or Dorothy often embellished the other books themselves or used decorations from antiquarian books. Complementing the illustrations provided by the artists was, of course, the art form of hand-set and hand-printed type, for which the Allens had a passion. 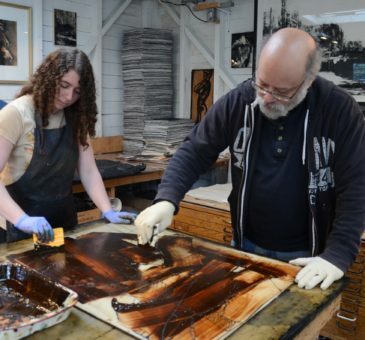 Hand-craftsmanship is after all the raison d’être of The Allen Press, and their legacy; their passion for this art form ran so deep that Lewis Allen wrote and published Printing with the Handpress in 1969. He believed that the book “at its highest achievement must always be a work of art” a feat only achievable with the hand, and dampened hand-made paper. The punching of evenly inked type onto dampened paper raised printing from a two to a three-dimensional medium. The highlight created around the recessed letters, often referred to as a “halo” gave the pages a glister of life that machine printed pages could never achieve. The handpress also made it possible to print two or three colors in one impression, which was efficient for printers that so highly valued colour in the compositions. The Allen Press is one of very few in the world that produced handmade books regularly and engaged in it as a full-time job. Unlike many small presses, they often completed all the pieces of book production in house: selecting the text, designing the compositions, hand-setting type, printing on dampened hand- or mould-made paper on a handpress, binding, often the publishing, and sometimes even the illustrating. The fifty years’ work of The Allen Press was accomplished by a husband and wife team, and the pleasures of those intricate particulars are cited often in their bibliographies. They printed in five different Bay Area locations, and also on sojourns in France. What we are left with is a small library of volumes, with brightly colored spines twinkling like nearby stars on the shelves. One can only imagine Lewis Allen hunched over a newly pulled leaf of wet type, with Dorothy seated nearby, brush in hand, lovingly hand-painting the ornaments in The Knight Paris. Or the pair traversing France for Mme Goll’s precious woodblocks, used in Four Poems of the Occult. The work could only have been completed with full hearts, and we would expect nothing less from those invisible heroes: printers, at The Allen Press. 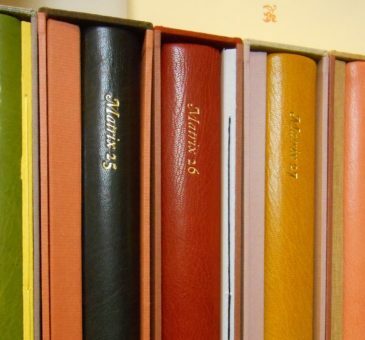 Matrix is known throughout the Bibliophile world for its quality and presentation of printing and illustration arts. John Randle, publisher and owner of the Whittington Press, shares some thoughts regarding how it got its start. The seeds of Matrix were sown by two items which needed to be published, but would not in themselves stand up as individual publications: the diary of a pressman at the Shakespeare Head Press from 1928, and Brocard Sewell’s recollections of working with the printer-engraver Edward Walters at about the same time. These two seemed to set the tone for Matrix, which has seldom strayed pre-1900. Its priority has become to record events while their perpetrators (or their heirs) are still with us, rather than rake over the ashes of already-recorded events. It then occurred to me that if we were to put these two together with a few other items, the result may have a wide enough scope to interest people in investing in the result. We kept ‘Whittington’ out of the title as I did not want to give the impression that it was a house journal for the Whittington Press, in fact all mention of the Press was banned until relatively recently. ‘Matrix’ was chosen as the title as the 72-point Caslon swash M would look good on the masthead. To keep costs down and keep it all under one roof we bought a Monotype caster and keyboard, some ingots of lead and a 12-point Caslon die-case (all for less than the local typesetter’s estimate for doing the whole job), and Matrix became the first job to be cast at the Press, and made its appearance in 1981. It was subtitled ‘A Review for Printers & Bibliophiles’: ‘Review’ because this suggested echoes of reviews such as the infamous Little Review which flourished (though they did for six months have to camp by the shores of Lake Michigan) in Chicago from 1914-26, and could claim Pound, Eliot, Joyce and Hemingway between their brilliant Dadaist covers; ‘Printers’ because this was to be a journal for printers, from printers, printed from type on a 1936 Double Crown Wharfedale cylinder press; and ‘Bibliophiles’ because it was also aimed at those interested in books and their contents. Optimistically, we placed a single quarter-page advertisement in Fine Print, which I had recently visited in San Francisco and been impressed to see the number of keen lady volunteers working happily away in Bush St. This proved prescient, as about a third of the edition crosses the Atlantic, and American support, both financial and editorial, has proved crucial. We priced Matrix 1 at £10 a copy and it quickly sold out, though I did give quite a few away, fearing it would suffer the fate of many small journals and, like the Australian Wayzgoose in 1985 and Fr Brocard Sewell’s The Thing of 1939, fail to make it to the second issue. This was encouraging for the novice publishers, though I had learned from my experience working with Fleet Street journals in the 1960s that a well-informed journal is, unlike book publishing, an attractive source of regular revenue, if only one can keep up the momentum and never have to scrape the barrel for content. Matrix is now at its thirty-fifth issue. Far from having had to scrape the barrel, the problem has always been to keep the length of issues within the capabilities of the Press. On the whole we have kept up the annual cycle (the number happily coinciding with the year), though with some considerable effort – just sending out close on 1000 copies worldwide, in a mix of regular and special editions (the specials are quarter bound in coloured leathers with marbled papers) is no mean logistical feat, not least for Rose who has to keep track of the orders. Lately, Matrix has had to give way to other large projects taking up their share of press time, and has lagged a little, though I was encouraged to read recently that there was a gap of twenty-five years between the last two issues of Rocky Stinehour’s journal Notes on Printing & Graphic Arts. Matrix has now been with us for thirty-five issues, and it is hard to imagine life without it. One never stops thinking about possibilities for the next issue. Our subscribers and contributors have been a model of forbearance and generosity – we used to pay the latter a modest honorarium but finally stopped when so many expressed surprise at receiving their cheque, so instead we try to be generous with the quality of the offprints of their articles, which indeed are appreciated. As many have discovered, editing a small review is a rewarding experience. Everyone enjoys being associated with it: readers enjoy being entertained, and people like to see themselves in print. As long as the initial effort of getting the flywheel turning proves productive, and worthwhile contributions continue to flow in, a momentum is generated than carries the whole circus forward year on year. Lifting eight-page formes on and off a Heidelberg cylinder press twice a day is heavy work, and I was glad of Patrick’s help with Matrix 31 in 2014. He has taken to the Heidelberg SBB as I took to the Wharfedale SW2 forty years earlier, on which the first four issues of Matrix were printed until the run outstripped the speed of the machine, and he has even suggested reprinting the thirty earlier issues with decent inking and impression. Meanwhile, no doubt tired of my obsession with the legacy of William Morris and the twentieth-century typographical renaissance, he has now taken to printing his own annual Double Dagger on the Heidelberg, a multi-colour tabloid celebrating the integration of hot-metal type with digitally cut ornament and illustration. He has recently completed the run of 4400 copies of the second issue, involving some 250,000 impressions. As we found with Matrix, number two is the key issue, it shows whether or not the series is intended to continue. Thus far, the omens seem good. Arthur Rimbaud, a young French poet in the second half of the 19th century, is known as one of the “grandfathers” of Surrealism, and yet – we don’t hear about him often enough. Today we would like to highlight this very singular literary mind and bring attention to how his work helped shape poetry, and culture, as we know it. Jean Nicholas Arthur Rimbaud was born on the 20th of October, 1854 in a small town in provincial France, the second of five children. Early on in his life his father deserted the family, and his mother was hardly an agreeable companion – quite severe and a devout Catholic, and utterly lacking in any sense of humor. Due to a rigid upbringing, Rimbaud became something of a rebel in his teen years, a feeling which would be quite apparent in his work. By the time he was 15 he had begun to show promise as a poet, and one of his teachers became a mentor and friend to whom Rimbaud would write of his feelings about wanting to escape. In his later teen years Rimbaud ran away from home several times – living on the streets as a vagrant before being returned home to his mother. When he was 17 he wrote to several poets asking for advice on his poems, but only one poet responded – Symbolist poet Paul Verlaine. Verlaine invited Rimbaud to come and live with him and his 17 year old pregnant wife, which Rimbaud did in September of 1871. Verlaine and Rimbaud formed a fast friendship, which soon blossomed into a romance. Their relationship was a tumultuous one, resulting in scandal and gossip. They separated, but came back together in 1873 when an inebriated Verlaine, overcome with emotion, shot Rimbaud in the wrist. Though they tried to cover the shooting up at the hospital, the next day Rimbaud became afraid that Verlaine would try to shoot him once more and told a policeman the truth. Verlaine was sent to prison for two years for the crime, and Rimbaud returned home and continued to write poetry. During his time with Verlaine, Rimbaud’s poetic style, though remaining quite obscene and/or shocking in nature, was heavily influenced by the wistfulness of Verlaine’s work. However, despite the influence Rimbaud continued to work toward his eventual final style – being one of the very first poets to write completely free verse, void of any rhyming or conventions. Rimbaud continued to work over the next three years or so, publishing a few stand-alone poems until 1875, when he virtually gave up his writing and wild lifestyle in favor of travel, obscurity and freedom. Rimbaud lived and worked in Cyprus, Yemen and Ethiopia over the coming decades, working several odd jobs as a construction foreman and a merchant. In 1891 Rimbaud developed what was (wrongly) assumed to be arthritis in his right knee, which led to intense pain and the eventual amputation of the leg. Unfortunately the cancer that was in the bone had spread throughout his body and he passed away in November of 1891, at the age of 37, in Marseille. The question on everyone’s mind, of course, is why Rimbaud would abandon literature at such a young age (only 21) and after so little time? Scholars agree that Rimbaud seems to have been burnt out on the literary scene and persona he had created for himself, and gave a hearty farewell to poetry and literature in his publication (which he convinced his mother to help finance) of Une Saison en enfer in 1871. The last nine sections of the book act almost as a “swan song” (Poetry Foundation) for Rimbaud and definitely give the reader evidence of RImbaud’s upcoming abandonment. Much of his further work was published in a compilation by Paul Verlaine in 1895, four years after his death. Though we will perhaps never know why Rimbaud would choose to give up on his writing talent, we can agree that his few years of work and utterly defiant lifestyle have given inspiration to many. Albert Camus, famed philosopher and author, hailed Rimbaud as “the poet of revolt, and the greatest”. His influence is almost indescribable: his style and syntactical choices pointed to Symbolist tendencies, Dadaism embraced his ability to write in abstractions and impossibilities, and Surrealists embrace Rimbaud as a predecessor. So many have looked to his life and works for their inspiration, including the British composer Benjamin Britten, American composer Harold Blumenfeld, Bulgarian composer Henri Lazarof, and German composers Georg Katzer and Andreas Staffel – to name just a few. Later in the century, Rock musicians Bob Dylan, Jim Morrison and Patti Smith would pay tribute to Rimbaud and author Octavio Paz, winner of the 1990 Nobel Prize in Literature, viewed Rimbaud’s importance to his own work equal, or perhaps even greater than, Mallarme and Baudelaire (N.B., from Wiki). Will we ever understand Rimbaud fully? Perhaps, perhaps not – but we revel in the stark beauty of his poetry and are thankful for his life, which while short, burned so brightly. Last month, we began a journey into the much respected and revered literature of the First World War. Whether it was written during the war, directly after its ending, or twenty years later, literature of this time holds a universality that makes it applicable to our lives even almost a hundred years later. In our newsletter last month, we got ready for the 100 year anniversary of the war’s end by examining the role literature played for soldiers in the trenches as well as some of the most popular novelists and poets of the time. We saw the differences between Erich Maria Remarque and Ernest Hemingway, who both wrote on anti-war themes by focusing on the personal, the beautiful and the sad. Other authors, such as Robert Graves and Siegfried Sassoon got behind a more personal, anti-war message in their writings – avoiding the sentimentality often seen by young writers of their generation and focusing more on the sheer brutality and horror of the war. Both writers were catapulted to fame, showing how popular all kinds of writing on the war could be – readers wanted the sentimentality – the love story of Hemingway, but also the truth from Robert Graves. As we see, literature of the First World War ranges vastly in different forms, different styles, and different themes. However, throughout it all we can see the absolute change war made on the idealistic young writers of the day. In fact, the difference in writing between the works of the First World War and the Second is clear – at the onset of the Second World War people were not so innocent anymore, they were attuned to the destructiveness of war and were far more realistic from the beginning. At this upcoming 100 year anniversary of the war, we remember the young men who fought for their countries and wrote vociferously on their experiences – experiences not so different from what young men and women experienced in the Second World War, in Vietnam, in Iraq, Afghanistan and everywhere war has affected the lives of all. In one year the world will mark its 100 year anniversary from the end of The Great War. The First World War captivated the attention of people all over the world for many reasons, as did the literature which sprang from the experiences of the War. 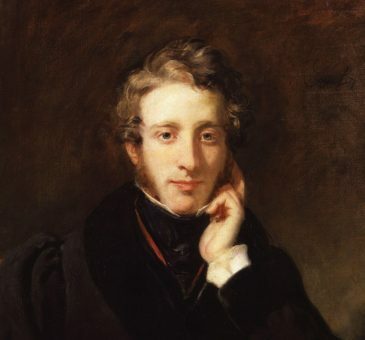 The reasons for the literature of the time being so varied, so popular and so well-written are numerous, but let us focus on the main reasons why it remains, to this day, so prominent in literary minds. At the onset of the Great War, there was still a certain amount of naivety and ignorance regarding what would happen. Only after the fighting began and the death toll rose rapidly did the innocence wear off and people quickly understood exactly what crushing desperation and grief felt like. The level of despair felt by not only the soldiers enduring long months cramped in underground bunkers and watching those around them become ill or die in battle but also by the family and friends at home waiting for their return (and waiting what was seeming like an unending amount of time) was constructive to writers’ creativity, no matter how destructive it was to their lives. Throughout the Great War, it was commonplace to find reading the main activity at the front lines. Often in the trenches classics were read, as it was sometimes difficult to get your hands on contemporary literature, and the soldiers – some of whom would go on to write their own memoirs or stories – paid close attention to detail, both on the page and in battle. Both during the Great War and shortly thereafter, literature presented itself with a subtle alertness and sadness that either directly or indirectly commented on the timelessness of the agony of war. Perhaps this is why these works are still popular today – they speak to any generation that goes through the kind of despair that only war can imprint on people’s hearts. A few of the heavy hitters of the time were books like All Quiet on the Western Front, written by Erich Maria Remarque and published in 1929. The novel about a young German soldier is a captivating look inside the war, from a very different perspective than the many English accounts of the war. Author Ernest Hemingway published A Farewell to Arms that same year, and despite half of the book being a love story, Hemingway is able to create the shadow of war hanging over Frederic and Catherine that many of the time knew all too well. Poetry was a very proliferate genre in the period as well, many poets being soldiers on the front lines – and often writing from the trenches. Poets such as Wilfred Owen and Isaac Rosenberg never made it past the age of 30, being killed in battle, but nevertheless their poems made a deep and lasting impact on poetry of the first half of the century – and no doubt had they lived the impression would have been even greater. Researcher Catherine W. Reilly counted 2,225 English poets alone during the first World War – of whom over 1,800 were civilians – some soldiers, and some those on the sidelines, watching the horror unfold. The name Eric Gill can be a controversial subject for bibliophiles and artists to speak on. Certainly Gill’s life is something of the extraordinary – an intense study of multiple art forms, excelling at each, a full workload and recognized talent in his day, and even heavy religious beliefs contradicting the expressiveness of an almost insatiable sexuality… all go into the beautiful work that came from a unique mind. The English typeface designer, printer and sculptor was born on the 22nd of February, 1882 in Brighton. He grew up in a large family – one of twelve children. When Gill was 15 years old he and his family moved to Chichester, a city in Southeast England. He was able to spend some of his teenage years studying at the Chichester Technical and Art School where he first gained interest in the arts. In 1900 he moved to bustling London, and began an apprenticeship with W. D. Caroe, a specialist architect who worked in ecclesiastical architecture. He enrolled in stonemasonry night classes at the Westminster Technical Institute to gain skills in sculpting with stone, and took calligraphy courses at the Central School of Arts and Crafts. Undaunted by the many different artistic arenas before him, Gill excelled in his work in all – calligraphy, masonry and as a letter-cutter alike. In the early 1900s, Gill married the daughter of the Chichester Cathedral sacristan and moved back to the county of Sussex, to a small town called Ditchling. He worked tirelessly, producing sculptures that were a curious mixture of domesticity and eroticism. 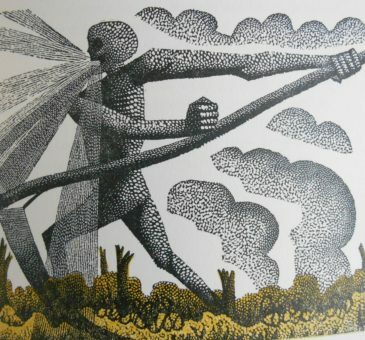 Some of his work included producing sculptures for the BBC London building and Westminster Cathedral, and then creating new typefaces and illustrations while working for the Golden Cockerel Press in Capel-y-ffin. 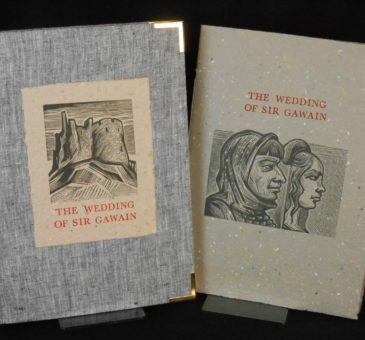 Much later on he would found his own hand-press with his son-in-law and print out Fine Press bibliophile dreams, like the ones we have here at Swan’s Fine Books. 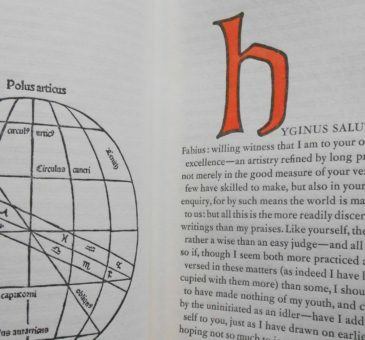 As Fiona MacCarthy, a Gill biographer states, “The striking thing about Gill’s work, whether carving, letter-cutting or typography, is his mastery of linear expression.” This seems absolutely true, as when looking at all of his work one cannot help but notice the artistry in the lines of text or stone. During his life, Gill was awarded several honors, including being named the Royal Designer for Industry in Britain. He was indeed eccentric, and though recent studies have shed new light on Gill’s personal and private life that one might find objectionable, we are awed by the true beauty of his art – especially his bibliographic works. We look at his book work with an open eye and are easily able to see the absolute craftsmanship that goes into each of his pieces. Don’t believe us? Come and see one for yourself at Swan’s Fine Books! Though Shakespeare’s works are notoriously difficult to date, scholarly studies show that his works Titus Andronicus, The Comedy of Errors, The Taming of the Shrew and The Two Gentlemen of Verona were works of Shakespeare’s earliest portfolio and possibly influenced by numerous playwrights, including Shakespeare’s contemporary, Christopher Marlowe. His first true recorded works are Richard III and the Henry VI plays, written and performed in the early 1590s, histories and dramas that were easily influenced by historical records and known facts about previous Kings of England. Shakespeare’s middle period is marked by his comedies – A Midsummer Night’s Dream, Merchant of Venice, Much Ado About Nothing and Twelfth Night. After these plays, Shakespeare introduces some comedic scenes into what are otherwise known as his tragedies… Richard II, Henry V, Romeo and Juliet and Julius Ceasar. In his final writings, Shakespeare wrote romances and combinations of tragedies and comedies… the likes of which had not been seen in Elizabethan England as of yet. He produced the plays The Winter’s Tale and The Tempest, among others – tragedies in theory, but they end with reconciliation and forgiveness, rather than mistakes and death. One interesting thing to note about this master of the English language is that for decades there has been some controversy over whether or not the man named William Shakespeare actually penned all the work attributed to him. If so, he was a very busy writer and a very clever person! If not, it means that work belonging to his contemporaries has been shuffled into the mix and he was given credit for things he did not create. Much of the controversy stems from a lack of personal documents that might (if they existed) remain today. Some Anti-Stratfordians (the term for those who believe that William Shakespeare of Stratford-Upon-Avon is not the author of the works attributed to his name) believe that the Shakespeare household was an illiterate one, as both his parents and daughters’ surviving signatures are simply marks, a common signature for the uneducated. Other supporters believe that there are codes to be found in some of his and the works of his contemporaries to suggest that Shakespeare did not even exist. Even we admit that it is quite strange that his will makes no mention of any documents, papers or unpublished plays (of which there were over a dozen). The only theatrical reference in the will is for some of the theater contemporaries to be gifted mourning rings – a line that seems to be added after the other mundane writing in the will, and therefore highly suspicious to Anti-Stratfordians. However, though the issue of authorship has become a popular topic in academia, the group of those who believe Shakespeare’s work to be that of a group of others is extraordinarily small in comparison to those who support Shakespeare’s authorship. It is commonly acknowledged that Shakespeare died on the 23rd of April (a date that is in contention with scholars as it coincides with the annual recognition of his birthday), 1616, at the age of 52. The only note that speaks to his death is a notebook written by the vicar of the small town of Stratford, noted down almost 50 years later, that “Shakespeare, Drayton and Ben Jonson had a merry meeting and, it seems, drank too hard, for Shakespeare died of a fever there contracted.” His death was indeed sudden, as its suddenness was mentioned in tributes from his contemporary authors. He was buried in the Holy Trinity Church two days after his death. His epitaph carries a warning to those wishing to steal his bones… “Good frend for lesus sake forbeare. To digg the dvst encloased heare. Bleste be man spares thes stones, And cvrst be he [the] moves my bones.” A clever and carefully worded epitaph indeed, but not one we might expect from someone that is commonly regarded as one of the fathers of English Literature!